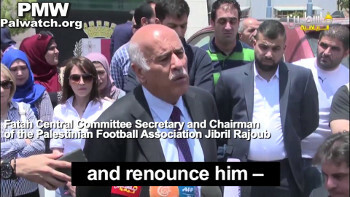 PA condemns FIFA for suspending Jibril Rajoub, "based on the claims of an Israeli organization... Palestinian Media Watch"
By Itamar Marcus and Maurice Hirsch, Adv. According to the PFA, PMW's complaint should not have been accepted because PMW is "not a neutral side," given that PMW is involved in an "unresolved dispute with the Palestinian Football Association." This apparently is a reference to PMW's two earlier complaints against the PFA and Jibril Rajoub, about which FIFA has not yet ruled. In March 2017, PMW submitted a detailed complaint to FIFA against Rajoub and the Palestinian Football Association (PFA), providing evidence that Rajoub was in breach, among others, of Article 53 of FIFA's Disciplinary Code. In May 2017, PMW submitted a second complaint after the PFA held its annual competition named after "Abu Jihad," who the PA credits with murdering 125 Israelis. Rajoub was suspended now following his recent calls for violence against the Argentinian football team. 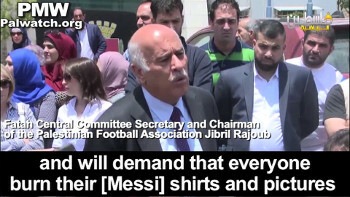 In May this year, Rajoub called to burn shirts and pictures of Argentinian star Lionel Messi after the Argentinian football team scheduled a friendly match with the Israeli national football team in Israel. Following Rajoub's statements PMW immediately submitted a third complaint against Rajoub. After the Argentinian team canceled the match in Israel, the Israel Football Association likewise submitted a complaint to FIFA. 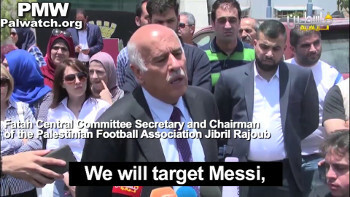 "The Disciplinary Committee has sanctioned the President of the Palestinian Football Association (PFA), Jibril Rajoub, with a 12-month match suspension and a fine of CHF 20,000 for breaching article 53 (Inciting hatred and violence) of the FIFA Disciplinary Code, following media statements he gave calling on football fans to target the Argentinian Football Association and burn jerseys and pictures of Lionel Messi." The Disciplinary Committee decision was based on the claims of an Israeli organization of settlers on the occupied lands (PMW's office is in west Jerusalem -Ed. 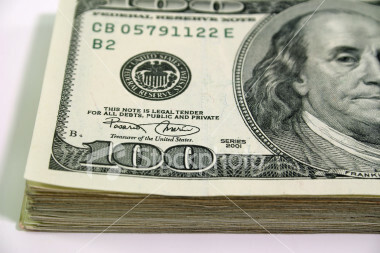 ), who call themselves Palestinian Media Watch (Palestine Media Watch) [English name repeats in parentheses in source]. These claims are connected to statements that were attributed to Jibril Rajoub on a Lebanese TV station in 2013 (Reference to Rajoub on Lebanese Al-Mayadeen TV that was one of many sources in PMW's first complaint against Rajoub; see note below- Ed). 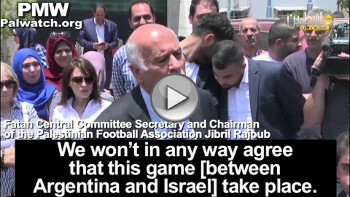 We are surprised by the speed with which FIFA rushed to convict the chairman of the Palestinian Football Association, relying on media reports of non-neutral parties, and this is as opposed to its slowness and hesitation on everything that is connected to ensuring the right of the children of Palestine to play on their lands and enabling the playing [of football] in the face of the occupation's actions. While emphasizing that we respect the law, the FIFA regulations, and the decisions of the relevant committees, we reserve for ourselves the right to deal with the matter in the relevant legal circles."